Is traffic calming more than 2000 years old? 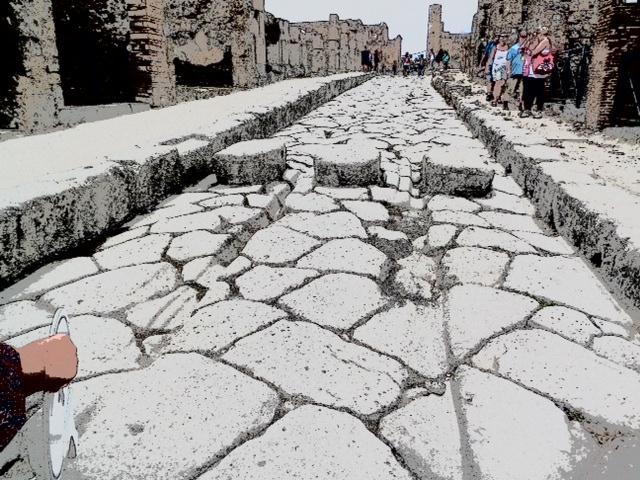 Here’s a [stylized] photo of what appears to speed humps across the street in the Roman city of Pompeii in Italy, destroyed by the volcano Vesuvius. Note the chariot tracks either side of the humps [actually more like modern speed cushions]. It is clear these must have slowed speeding chariot drivers! The official explanation for these structures is that the Romans ran their waste material into the street and stepping stones were needed to cross the street to avoid the mess. However the Romans were master engineers and there are many signs of underground drainage so who’s to say these stones were not intended to slow chariots!